Hi all. Today we will be continuing with our Chinese themed spa series that is great if you want to use in your spa/ reflexology centres. The Chinese themed spa series includes Fresh Ginger, Green Tea & Lavender Massage Oil, Satsuma & Eucalyptus Detoxifying Cream Bath, and Rosemary, Ginger & Lime Gentle Polish. The cream bath uses a jojoba lotion base with cocoamidopropyl betaine to give a mild cleansing effect. 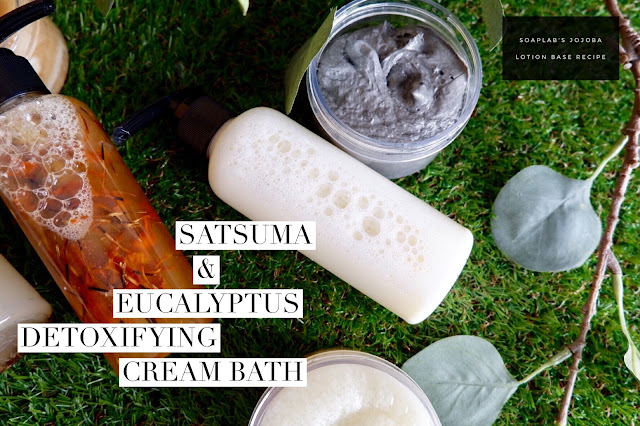 We have also added eucalyptus essential oil that helps in calming itchy or allergic feeling, and Satsuma fragrance oil for the scent. Jojoba is extremely useful to skin as it nourishes and moisturizes it. Eucalyptus essential oil helps reduce inflammation, and reduces soreness of the body. Satsuma fragrance oil provides a unique fruity aroma. We hope that this is a great addition to your business and spa. If you ever need any help; don’t forget to contact us!